https://theworldatoz.files.wordpress.com/2019/03/we-double-dog-dare-you.m4aSometimes an adventure or an idea pops into my head and it’s so “out there” that I actually hear a voice in my head daring myself to go for it. It could be the idea of bungee jumping (not gonna happen) or going on a grand hike somewhere. It could be the idea of a new phase of my life that involves quitting my job. It could be deciding to finish that book I started writing years ago. The list goes on and on. We are in the midst of a HUGE change … moving to the desert Southwest from Virginia. Both of us have lived in Virginia for more that 15 years. In fact, I’ve been here for more than 20 years. So … this move is a little of a personal dare for me. The act of moving isn’t all that adventurous for me. I counted the places I’ve lived in my life today and came up with 36. I kept track. Many of the places I lived are due to my military past – both as a “brat” whose Dad was a career Air Force Officer and as an active duty Airman. As for Greg, the desert Southwest isn’t much of an adventure. He grew up in Southern California’s San Fernando Valley so it’s a bit of returning home for him. But moving across country after so many years is an adventure. We like to think of it as the great American couple on a great American adventure. We will load a few things into our car (the rest is being shipped out) and make the cross-country drive into a road trip. We’re excited to take this step, but a little sad to be saying goodbye to friends we’ve made and places we’ve come to know. So we’ve decided to have one final fling in the home we’ve come to love, but that we’re ready to leave. We’ve invited all our East Coast friends to join us at one of our favorite haunts, Fat City Kitchen in Alexandria. It is here, steps from our Alexandria home, where we made dozens of new friends and created a whole new family. It is here where we were inspired, where our ideas were discussed, and decided upon. It is here where we’ll end one adventure and start a new one. Whether you’ve been a fan of our blog, a casual reader or a newcomer, we double dog dare you to come out Saturday, March 30 to say hello and good luck, and wish us well as we head west. We’re not going to stop doing what we do … we’re just starting from a new headquarters … one that will introduce us – and you – to new places. There’s a whole world out there waiting to be explored … we double dog dare you to see it! Literally, pied-à-terre is French for “a foot on the ground,” but Wikipedia says the phrase implies usage as a temporary second residence (but not a vacation home), either for part of the year or part of the work week, by a reasonably wealthy person. I’d love to say I am “reasonably” wealthy, but my husband and I are just a typical professional couple doing our jobs and living for our next trip to anywhere. So when we finally bought a home together, we decided to think of it as a pied-à-terre. It’s where we live while we save up and plan our next getaway. Of course, our home is where we live MOST of the time. It’s where we spend the work weeks and every weekend we can’t get away to somewhere. So it really is a permanent home, not a temporary second residence. That said, walking around it, we hope our visitors get a sense of our desire to see the world. We decorated it with maps and globes and compass roses that evoke travel. The walls are canvases where we showcase images we have captured on our vacations. The food we serve to our guests gives an insight into the flavors we’ve discovered in hidden corners of cities and towns across the globe. We are always learning and exploring wherever we are. That includes our hometown. Just last week we learned that a new poll says ours is the “Best Downtown in America” and we agree. Not only is our town walkable, there is so much to see and do. It’s full of interesting architecture, museums, restaurants, bars, shops and more. Not only that, but our little neighborhood is like the neighborhoods of my youth. Young couples hang out and chat while their children play on the cul-de-sacs. Slightly older kids ride their bikes and scooters along the paths that encircle the neighborhood, winding their way to a huge city park nearby. Friends and strangers smile and exchange hellos as they wander those same pathways, some with dogs happily trotting along. It’s all a lesson. Live where you want to be. Find a place to call home, but use it as a jumping off point to see the world. There’s a great big world out there just waiting to be explored. What a difference! A couple of months ago we went to the Brabo Tasting Room in Old Town Alexandria, Virginia. It was amazing. In fact, the experience was so good that when friends suggested we meet for drinks and dinner, we tapped Brabo by Richard Wiedmaier for the rendezvous. We were excited to try the full restaurant version of the tasting room. We arrived without reservations about 7:15 Friday night, hopeful we would be able to get in. No problem! Surprisingly, the restaurant was only about half full. Despite all the open tables, the maitre’d still took a long look at the computer screen before deciding he could seat us. I should mention we were there for a little over an hour and the restaurant was never full. That was the first indication the service was a little surly. Our waiter, who never introduced himself, practically scoffed out loud when we ordered starters without ordering entrees. Initially, we weren’t sure if we were staying for drinks and a light repast, or if we would eventually order dinner. The starters came with a perfectly respectable pause and we were served without comment. The menus had not been collected (presumably to give us time to decide on entrees), and after a couple of bites, our supercilious waiter came back and mentioned there was a special – pan seared scallops. By then we had decided we’d had enough of the terse service. Several times while we waited for the appetizers, we tried to flag down the aforementioned waiter only to be soundly ignored. He collected the menus, never once asking if everything was OK. We eventually managed to get his attention for another round of drinks, but he took the order from one member of our party (there were three of us) and never even looked in the direction of the others to see if anyone else wanted another drink. Before I go any further I should point out that the five of us had ordered three different starters (three of us got the same thing) and we were all THRILLED with the food. It was perfectly prepared, perfectly timed and amazingly presented. The busboy who served the food (not the waiter) was so smooth in his delivery I almost didn’t even see him. Another busboy who kept everyone’s glasses of water topped off never missed a beat and was polite and efficient in the best possible way. Unfortunately for Brabo, the bad outweighed the good and we all decided to take our business elsewhere. When we finally managed to flag down the waiter and ask for the bill it was delivered quickly. The name on the bill was “Mike C” … was that his name or was that who was logged into the computer that spit out the bills? In any case, “Mike C” got a slightly less than 10% tip for his surly, in fact rude, attitude. Certainly a $230 bill for drinks and starters deserves better service than that. If you want great food and friendly, delightful service … stick with the Tasting Room or go elsewhere. Have you ever seen an ad for some event, thought it looked interesting, then been disappointed when you went? 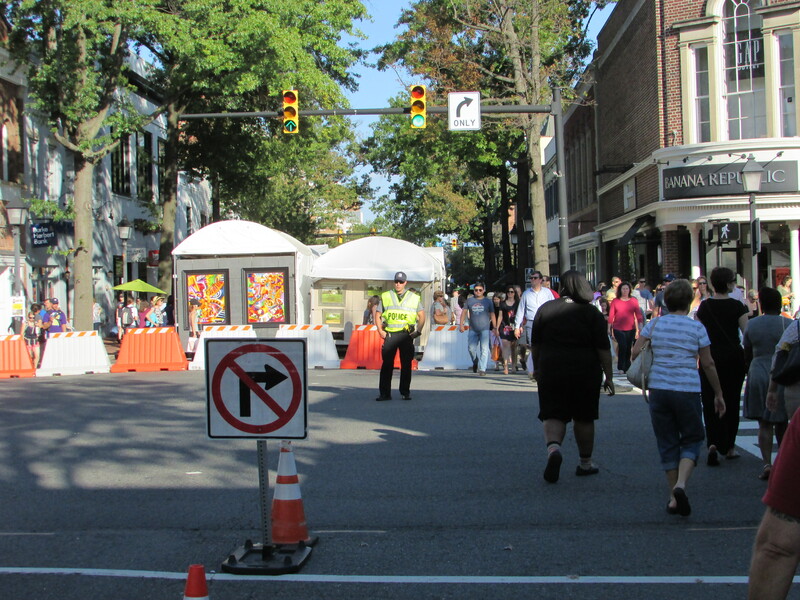 Fortunately, the Alexandria King Street Art Festival is NOT one of those things. In fact, it’s exactly the opposite. A HUGE gathering of artists representing nearly every conceivable art medium jamming more than half of King Street for an entire weekend! It’s a stunning spectacle of color and texture. 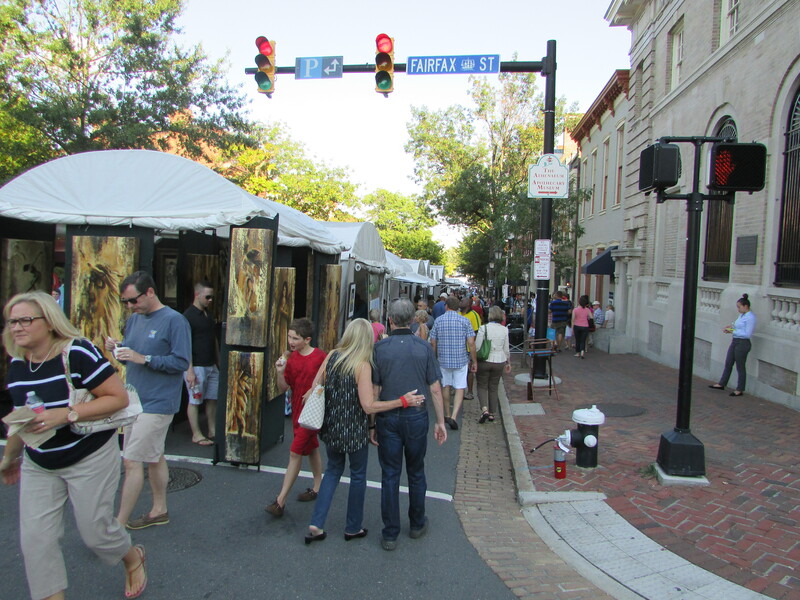 The 13th Annual Alexandria King Street Art Festival was our first; an event is so large and so full of art that it’s hard to believe it doesn’t have a website yet. Luckily, I had spotted a couple of ads and posts on Twitter from the essential source for all things Alexandria, Red Brick Town. I was intrigued enough to cancel other plans to check it out. We headed toward the water on King Street, thinking the blocked off portion was the bottom two or three blocks. As we approached US 1, we realized it started WAY above Fairfax Street. It started at US 1! WOW! 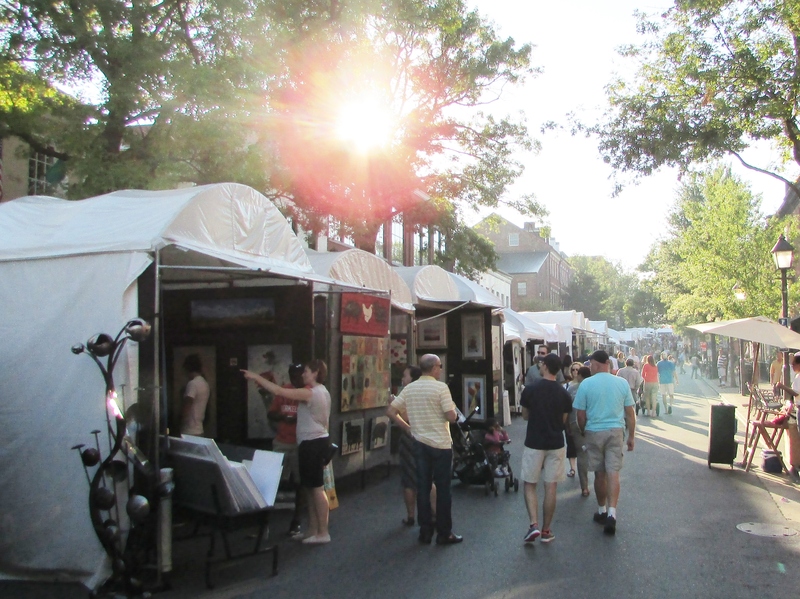 Artists from Florida to New York, Indiana to the coast lined the street in booths – back to back all the way to Fairfax Street. That’s where King Street narrows and the artist booths get a little bigger. They open on both sides of the street so you get artists next to another instead of also back to back. The intersections for cross streets are blocked off and filled with sculptures. 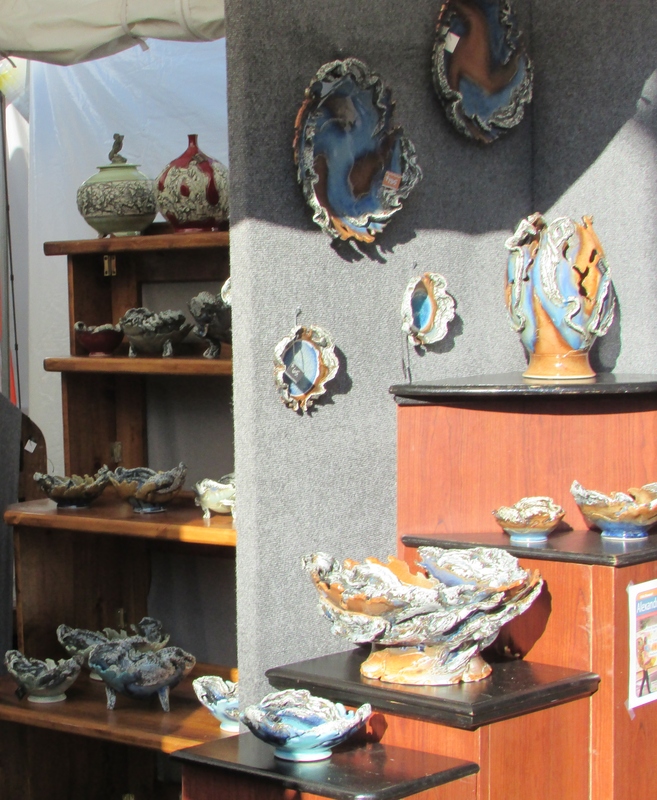 It is a cacophony of art – paintings, photos, mixed media, sculpture, jewelry and more. You can find clocks and furniture, wall-hangings and scarves. Despite the crowds on Saturday afternoon, it never felt over-crowded. The sun shone brightly, but the heat was mostly moderate for the last Saturday of the summer. We overheard one of the artists tell someone Sunday is always a better day. The forecast did, indeed, call for more moderate temperatures, but still sunny skies. We found a few items worth making note of for our future new home, including some really cool wood sideboards and end tables. We’ll be back next year with our measurements…ready to buy. We stopped by our favorite haunt in Old Town Alexandria yesterday to have a quick drink and say hello to our favorite bartenders. It’s been awhile since we’ve been to Union Street Public House; we’ve been so busy lately we just haven’t made it to the waterfront. We bellied up to the bar and ordered drinks from Johnny. The other regular bartender, Bruce, was bartending a wedding and off for the night. 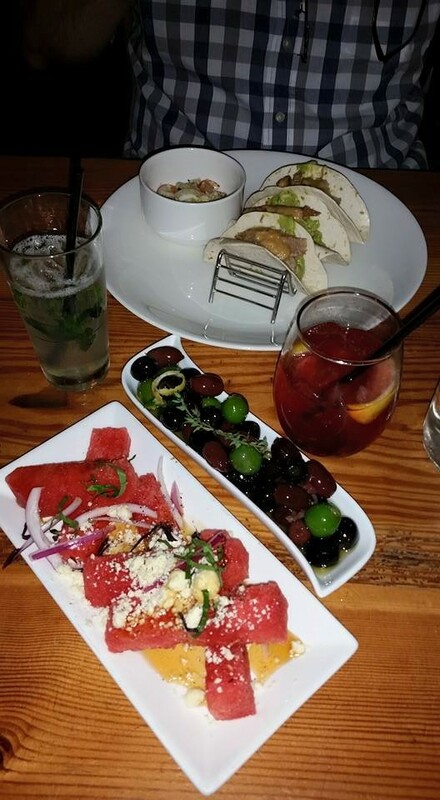 After the first couple of sips, we figured we had better order an appetizer, too. For the most part, the bar food menu is never the same. This time, scallops with bacon and broiled watermelon looked tantalizing. Then a classic Union Street staple caught our eye – The Wally – an item that is a perennial favorite at Union Street. We ordered both. When the Wallys were delivered and we took our first bite, I knew the Wally is worth its very own blog. You’re wondering, “What on Earth is a Wally? 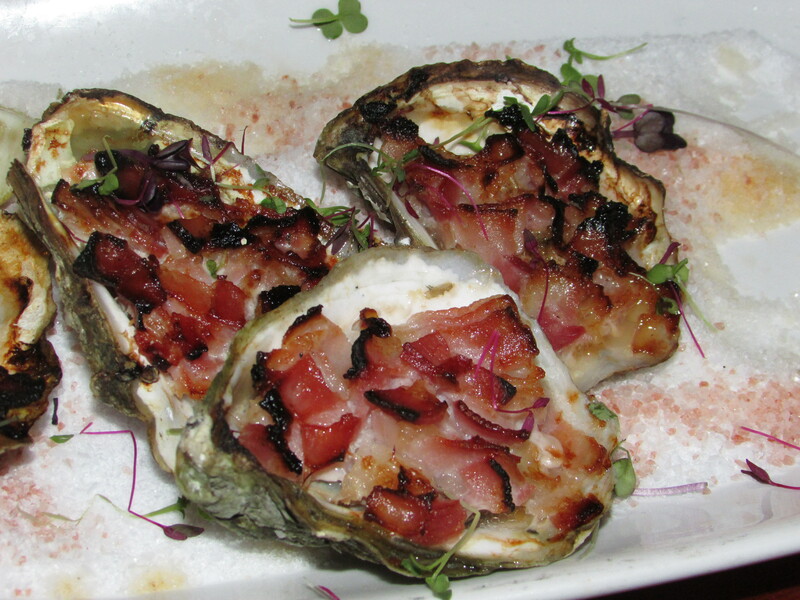 Well, it’s a fresh oyster, topped with a little butter and bites of bacon that is run under the broiler to give it a quick crispy finish. The scallops, bacon and watermelon were also delicious, but, OH, the Wallys! I know a blog about a specific menu item is a little unusual. I don’t know if Wallys are made anywhere else. I just took a bite of the first Wally and knew I needed to share. Come to Alexandria. Take King Street to the waterfront, make a right on Union Street and about a block up on the right, go into Union Street Public House. Do yourself a favor and enjoy the ambiance of the Taproom (kids are welcome at the booths), say hello to Bruce and Johnny, and order some Wallys. Tell ‘em Judy and Greg sent you! Last week, on the eight month anniversary of our marriage, Greg and I decided to splurge on dinner out. It was one of those “Chamber of Commerce” evenings that are so rare in August – warm temps with low humidity after a more normal stifling week – so we wanted to dine al fresco. Hunting Creek on King Street in Alexandria, Virginia, seemed like the perfect place with its shady, “not on the sidewalk” patio. We had been there once before in February right after they opened, but for obvious reasons, the patio wasn’t open yet! The food in February had been tasty – certainly good enough to give the restaurant another visit. We strolled down about 6:30 in the evening and lucked out. There was a table open on the patio. In fact, there were two available tables and the friendly hostess gave us our choice. We opted for the table in the middle so we could watch people strolling by on King Street while we ate. The menu surprised us. It had definitely expanded since our winter visit and now included some tantalizing options. Even the drink menu was intriguing. We had planned a glass of wine and maybe a little bubbly to celebrate our special day. 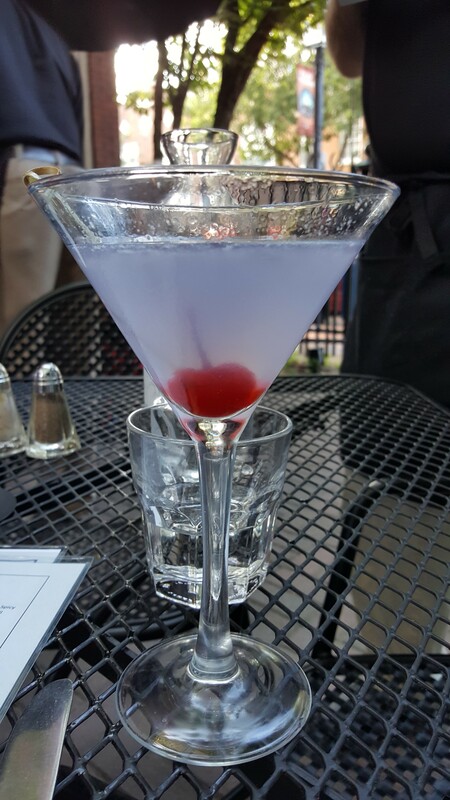 Instead, we ordered from the specialty cocktail menu – a Rye Manhattan (served in a martini glass) and something called “Aviation.” It turns out the Aviation was a very pretty pale purple concoction of Gin, fresh lemon, Crème de Violette and a Luxardo Maraschino cherry. It was as delicious as it was pretty. Sipping our cocktails, we perused the menu and ordered the heirloom tomatoes with corn relish to get started. This fresh, colorful dish popped with flavor. The tomatoes were vine-ripened-sweet, the corn in the relish was delightfully crisp. The flavors were perfectly paired. The food was so good we overlooked the confusion of having what seemed like an endless stream of waiters. The hostess saw to our seating. The first uniformed server took our drinks, then another came to ask about our food order. A fourth tended to our water glasses and standard staple of bread and butter. Another gentlemen (the manager? the head waiter?) stopped by to ask about the service. It was a little unsettling. The food waiter took our entrée order: a filet mignon for me, scallops for Greg. I ordered the four ounce filet medium rare, but it arrived overcooked. I can count on one hand the number of times I have sent food back in my life. This was one of them. While we waited for the steak to come back, we shared Greg’s scallops. We usually split our entrees anyway, so this was perfect. The scallops, sautéed in garlic lemon butter were outstanding! We noticed a very light coating, which gave them a delightful touch of crunch before the soft bite of a perfectly cooked sea scallop. The sauce provided a brilliant accompaniment. We were just finishing them up when the properly cooked steak arrived. It was delivered by the server we guessed was either the manager or head waiter. He apologized and offered to comp the glasses of wine we had ordered with dinner. He also delivered the previously-overlooked steak knife. One cut, right down the middle, revealed that brilliant, almost-red color of medium rare. The texture was sublime. Even if the steak was a bit on the cool side, I think the best way to cook a great cut of meat is that touch of sear over the blissful flavor of beef. The chef nailed it! It’s hard to say no to dessert when everything else is so terrific, so we didn’t. In February we had been talked into the panna cotta, so we figured we give it another go. Panna cotta is not easy to get it right. There’s a creaminess about a good panna cotta that must be hard to achieve. I’ve never tried. I have had a LOT of panna cottas that go just beyond creamy to gelatinous. In February the panna cotta was stunningly creamy. This time it was not. There was just a touch of creaminess hidden in a gelatinous, albeit flavorful scoop. All-in-all, Hunting Creek was well worth the stop for the food, but Old Town Alexandria has enough other options to try for a better dessert. We also recommend Hunting Creek tighten its service delivery. Again, it wasn’t that the service was bad – our needs were well met – it was just hard to figure out who was who. So much of what makes a meal a culinary adventure is the service that comes with it; Hunting Creek has enough going for it that service shouldn’t prevent it from being stellar. True confessions … we’re not big fans of beer. Oh, we have our favorites for when you just have to have a beer – Bud Light for Judy (that’s the St. Louis girl in her) and Hofbräu for Greg (German, ja?!). Modern craft brews that are all the rage have a bitter bite that we’ve just never been able to appreciate. But we keep trying! Here’s the deal: Between 2 and 2:30 in the afternoon, we had to pick up a free punch card with the names of seven Alexandria hot spots. All we had to do was go to each pub during the three- to four-hour pub crawl “window,” get our card stamped, and at the end we’d receive a Port City branded pint glass. No purchases were required, but each pub featured two or three of Port City’s brews at a discounted price. Stop one: Pizza Paradiso. We just love this pizza place. But because this was the starting point of the crawl, it was pretty crowded. We grabbed our punch cards and headed out. One of the workers slapped a sticker on Greg’s back; he jokingly asked whether it said “kick me” on it. Judy put one on the back of her shorts. Stop two: The Fish Market. The crowds hadn’t quite packed in yet, so we found a couple of bar stools and ordered a Port City Essential Pale Ale to share. We chatted with two young women at the end of the bar and made an immediate connection – one was private pilot just like Greg! It was just after two o’clock and we were ready for a mid-afternoon nosh. After a quick perusal of the bar menu, we opted for the crab bites. WOW! These little mini crab cake poppers dazzled our taste buds. Stop three: The Waterfront Market. Tables and umbrellas set-up on the water’s edge gave us the perfect chance to sip summer brews and people-watch. We chatted with “Tom” who told us he wasn’t employed by Port City, but he often helps out with events. When asked why, he easily answered, “Cuz I love the beer.” Tom knew everything about the brewery and its beers. He described the specials at this stop and offered insight into the others we would be encountering. His brilliant descriptions led us to try our favorites of the day – the Optimal Wit, a Belgian-style White Ale, and the Derecho Common. Tom told us the beer got its name from the late June 2012 Derecho that caused major destruction in the Washington, D.C., area. Like thousands of locations, the brewery lost power for several days and as a result, they couldn’t control the fermentation temperature in a tank of lager. But they saved the beer as a California-style common. The results were so good they have continued to offer it each summer since. Stop four: Chadwick’s. It was more crowded here than we expected and a little hard to get to the bar, so we decided to grab a glass of cold water and skip the beer offerings at this stop. Stop five: Virtue Feed & Grain. An available table was too hard to resist. We grabbed a seat, skipped the beer, and ordered some drinks and another snack. This time it was pork tacos and watermelon with feta. We’ve been past this restaurant many times, but never stopped in. It was a fabulous surprise! Scrumptious food made for the perfect break from the increasing heat outside and crowds at the bars showing the obvious success of the pub crawl. Stop six: Daniel O’Connell’s. More true confessions – we avoid Irish pubs, aka Italian Purgatory. O’Connell’s is always jumping on weekend evenings, so we wandered to the back just to check it out. But we decided to escape the crowds to head to the last stop. Sure, it was early, but we figured what better place to end our “crawl” than at our favorite go-to place on the waterfront. Stop seven: The end of the line – Union Street Public House. It was just before 5 p.m. and much to our delight, our favorite bartender, Bruce, was already checking in for his shift. As expected, there were still a few seats in the Tap Room. Satisfied that we had tried enough Port City brews for the day, we switched to our signature cocktail – the Blue Ice – and settled in to people-watch and chat. We met the CFO of Port City, who shared a little more info about the company and its offerings. We munched on an incredible berry cobbler and just enjoyed the day and each other. Around 5:30, the crowd was almost overflowing into the street. The Port City crew headed into the Oyster Bar to pass out the pint glasses to everyone who had managed to check in at all seven pub crawl destinations. A line formed and moved quickly. We got our glasses but stayed as the crowds thinned, striking up a conversation with a couple seated at the bar next to us. New friends! We chatted for an hour or so and asked if they wanted to join us for dinner. The wait times for most of the places on lower King Street were approaching an hour, so we headed off to Bilbo Baggins on Queen Street, just a couple blocks away. We give a big shout out to Port City Brewery for sponsoring this fun and festive event. It gave us a great opportunity to try some new places, try some new brews, and meet new friends. And isn’t that what life is all about?